designed on our own initiative. The Family Gagarin was first published at 2rebels and Fontshop Benelux. The typefaces Cerny, Laika and Sjablony are part of the Linotype / Monotype Collection. All the fonts are designed by Novo Typo. 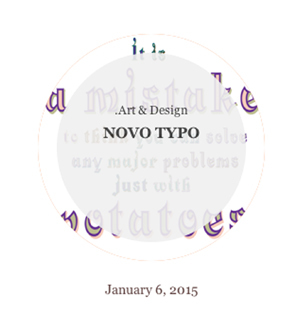 Read more about our definition of the dynamic identity of Novo Typo. 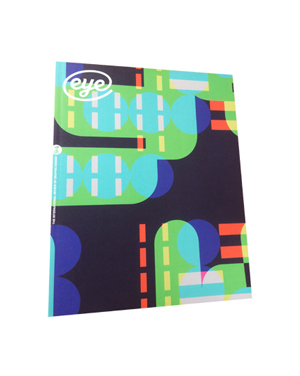 Read: Eye Magazine, no. 94, vol. 24, 2017 - by Jan Middendorp, Berlin. Mark van Wageningen of the Amsterdam foundry Novo Typo recently caught the international type scene's attention with a handful of projects featuring inventive and innovative colour fonts. He is, however, by no means a newcomer. During the past two decades he has been a book designer, identity designer and type designer, often seeking highly personal solutions to pedestrian problems, making irreverent work that challenged the viewer (and the client) with charming, unusual, yet approachable results. Now that he has decided to focus on what is also known as chromatic type, his long years of broad unorthodox activity are paying off. The term 'chromatic type' is now mostly used to denote digital type families designed to create multi-coloured designs by layering frames in layout programs. Many of the designs lean heavily on the aesthetics of the mid-nineteenth century: trompe l'oeil effects galore, with bevels, 3D-shapes, inlines and shadows. Van Wageningen's work has managed to shake off those nostalgic elements. Eschewing Victorian ornamentation and third-hand Modernism, his Novo Typo project explores ways to deconstruct letterforms, rebuild them from multi-coloured fragments, and present them as something surprisingly usable. Not just that: the fonts are also in a format that allows all colours to be packed into a glyph, resulting in multi-coloured web fonts. When it comes to suggesting new ways of using colour in typography, Van Wageningen is suddenly miles ahead. It hasn't always been that way. In the 1990s and early '00s, Van Wageningen designed mildly unconventional book covers and posters, often adopting self-designed typefaces in grunge-like styles that digitally represented the handmade. Several of these were subsequently published at Linotype and Montreal's 2Rebels. There were some avant-garde elements in his most unorthodox typeface project of the period, Gagarin (published 1998-2003). Van Wageningen's presentation of the face was typical of his tongue-in-cheek approach: 'Compared to a real family, a typographic family is usually a rather dull show. Where is the criminal nephew? Where is the uncle who knows all kinds of tricks?' With a wide range of styles designed within the same geometric grid, Gagarin aimed to provide all that and more. The series even included two 'female' fonts with incongruous calligraphic contrasts, created at Van Wageningen's request by left-handed designer Nele Reijniers. Throughout the 2000s, Van Wageningen's urge to experiment and push back frontiers grew stronger. The cookbook Kook is a case in point. The recipes are typeset as dense type constructions, intriguing yet verging on illegibility, built with a rounded, square sans serif designed especially for the book. The moment, however, when Van Wageningen began to venture where no type designer had gone before was when he discovered colour fonts. In the mid-2000s he began exploring the possibilities of chromatic type, both from a design point of view and on a technical level. He designed a number of digital fonts that could be used to create multi-colour typography by layering various versions of the 'family', including fonts offering coloured fills, shadows and bevels. Van Wageningen was exploring this route with attractive display faces that could be layered, such as Guru, Wolf and Fata. These were conventional stackable fonts, to be used with frame-based applications such as InDesign and Illustrator. In the early 2000s, design software companies developed formats that allowed type designers to pack colour into single glyphs, originally to support the use of full colour emoji icons. Noticing that phenomenon, Van Wageningen began to speculate about adding colour to the black-and-white, positive / negative universe of conventional (digital) typeface design. He was not interested in the decorative function of colour: to him, colour is a way to analyse or display the construction of each letter. And as a typographic tool to create distinction within a text, it was given a greater complexity than ever before. On the strength of his early experiments he was approached by typographically inclined front-end developer Roel Nieskens, who subsequently solved technical issues and created a project website. Nieskens had embraced Adobe's new OpenType-SVG format, the most flexible of the formats that enable the use of colour fonts on the web. With Nieskens' help, Bixa, a stackable all-caps display typeface, designed as separate layers, was taken into the new realm of multicoloured web fonts using OpenType-SVG. Bixa was one of thirteen winning typefaces at the 2016 Type Directors Club (TDC) competition, and was immediately developed into a new project: Novo Typo Typewood. The various layers of the Bixa typeface – many of which only contain a part of each character, like a left or right vertical stroke, or a fill – were produced as large wood type fonts. The painstaking process of selecting the wood and the production technology was guided by Van Wageningen's quest for a natural appearance. Testing a laser-cutting process on plywood yielded wood type that was too clean and smooth: 'The results were too perfect and the experiment failed,' he said. Testing with a CNC (Computer Numerical Control) router on three types of wood resulted finally in what Van Wageningen likes to call 'the perfection of imperfection'. 'Perfection is nice but perfection is also a bit boring. I like it when there is something that somehow looks wrong. Technically everything should work perfectly, but in the design I like to see happy mistakes. Things you cannot design on purpose, that happen just by accident.' The Typewood-Bixa project resulted in an oversized brochure that combined offset and letterpress technique, as well as a series of posters showcasing multi-coloured overprinting of the various wood type fonts. Is legibility a concern? 'Of course, but I try not to think about it too much,' he says. 'My approach to design implies that legibility in contemporary type design is a bit overrated. Every character is legible. If not, it is not a character anymore. Ruminating about conventions will keep you on the safe side of the line; it makes you conservative and conventional in your design decisions and will impede progress. TypeCon, August 2016, Seattle, USA. TypeCon is an annual conference presented by the non-profit Society of Typographic Aficionados (SOTA), an international organization dedicated to the promotion, study, and support of typography and related arts. about their love of typography and its power of communication. Typography give us the opportunity to communicate in a very direct way. It's a visual language, and we consider a typeface as a set of beautifully shaped abstract signs. We like when fellow designers use our typefaces, and believe that by sharing our work, we invite designers to play with our typefaces to create something inspiring, while embracing collaborating and sharing as much as possible. 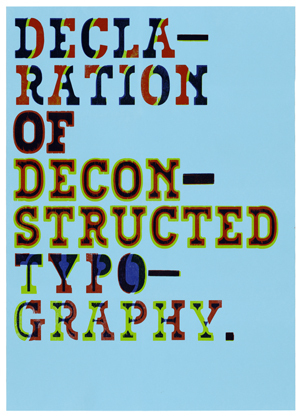 What do you consider the point of typography? We think that a typeface will be the most important part of a corporate identity and that stands as a key point. That is why we think that every company or organization need to use their own customized / bespoke typeface. A typeface can visualize your personal voice or language, and can show who you are and what you stand for. We believe that within a few years, typeface will completely take over the role of a logo or a colour scheme in a corporate identity, and we consider this a very good development. Although we like to communicate, we think that readability is often mixed with legibility. Sometimes typefaces have different purposes depending on the job at hand. If you ask us to design a typeface for you, we guarantee you that you'll get something you've never seen before, and it would adhere perfectly to whatever brief you set. We never comprise design, and feel we can mesh the world of interesting and innovative typography and strongly communicate information if that is what the client wants. At this time we design typographical patterns for a client in the fashion industry. We also work on several corporate identities and a packaging line for luxury home accessories with our own typefaces. Can typography go between fine and bold and if so how and why? and how does this help in communication of messaging? Your questions puts up another question. Why? This question we ask ourselves everyday. Why is a typeface fine, bold, italic, bold italic? Because we all agreed to do it like this? Because Microsoft or Adobe puts these typefaces it in your computer? Because your teacher told you to do it like this? We like to question these questions. Who has inspired your own creative journey over the years? Our main source of inspiration has its roots in Russia, particularly in the 19th century. Aleksander Rodchenko, Vladimir Majakovski, Gustav Klucis, Russian Constructivists / futurists. We also like Horta, the Belgian Art-Noveau architect and Lucien De Roeck, designer of the logo, the 5 pointed star, for the World expo in Brussels in 1958. We admire the work of Jurriaan Schröfer, a Dutch typographer, designer Anthon Beeke and some of the work of designers Jonathan Banbrook and Peter Saville. Concerning our design approach, the Do-It-Yourself punk movement from late seventies/ early eighties had a huge impact on our way of working and thinking as designers. Check out more from Novo Typo on their Website, Facebook, Twitter and Ello. 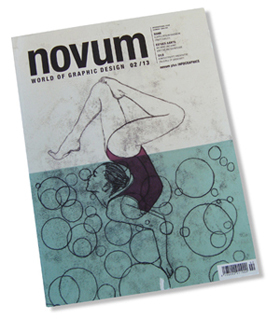 Read: Novum Magazine, page 30, - Typeface Iconoclast - by Victor Garcia, 2013.
of readability and legibility that are demanded by perfectionists and held aloft the cloister of academe. find inspiration in non-Latin typefaces, such as Cyrillic, Chines and Japanese, claiming that they let them appreciate the beautiful shapes of the letters, freed from the literal meanings? Novo Typo. that emerged from various projects such as sign systems, corporate identities, bookcovers and posters. 'We like to make "imperfect" typefaces. In a technical way everything should be perfectly set, but in the design of the typeface, we like to add some imperfection, irregularity and disorder in the shapes of our characters. We think perfect is a little bit dull ... Nowadays there is a generation of too perfect type designers. We think it's beautiful when there is something wrong, at least it is miuch more exciting.' Perfection is divine, and they design for human beings – who are by definition perfectible – and their designs must reflect that sensitivity. Sharp, provocative, unbiased, talented ... they are enfants terrible who think – and work – really very well; with new, fresh ideas about typographic work which they express in their designs. The development of Mark van Wageningen (1969) as a type designer is typical of his generation. Having graduated from the Amsterdam Rietveld Academy in 1994, his early typefaces were derivative and grungy; but his interest in letterforms deepened and culminated in an extensive family of constructed typefaces, Gagarin, still expanding at the time of this writing. their packaging and specimens. Several of them were later licensed to international foundries. again and returned to the computer.' Cerny (1995) looks equally destructive, but was not derived from an existing typeface. Using a technique practised by fellow Amsterdammer Willem Sandberg, Van Wageningen tore each character out of black paper, then digitized the result without much alteration. Cerny, a rough-and-tumble caps-only alphabet with no counters, is an amusing experiment of limited use. 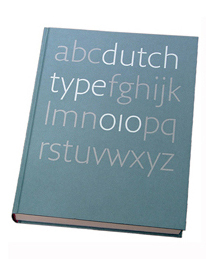 It was judged interesting enough for inclusion in the TakeType 2 collection published in 1998 by the Linotype Library. Two more fonts by Van Wageningen were on that CD: Laika and Sjablony (from sjabloon, the Dutch word for stencil). Of his 'rough' fonts, the stencil type Zkumavka is the most interesting. It has rather original forms that are vaguely reminiscent of 1920s display lettering, and is surprisingly legible in smaller point sizes. Zkumavka dates from 1995 but was not published until 2002, when it was released by 2Rebels in Montreal. Van Wageningen was first brought into contact with 2Rebels by FontShop Benelux. He had long been playing with the idea of a typeface family structured in an unusual way. In an article presenting the Gagarin family, he wrote: 'Compared to a real family, a typographic family is usually a rather dull show. Where is the criminal nephew? Where is the uncle who knows all kinds of tricks? A type family usually goes from roman to italic and from thin to thick ... These boring series allow very limited space to the individual freedom of their members. ... The Gagarin family is a real family, like life itself, in good times and bad times.' This last phrase is a reference to a well-known Dutch tv soap. As his font names indicate, Van Wageningen is fascinated by Russian culture, especially by Futurism and Constructivism. Gagarin is the first typeface for which he has actually taken clues from that period: it is partly based on the geometric principles apparent in the lettering of Rodchenko and the Stenberg brothers and copied in a lot of vernacular lettering from the Soviet era. Each variant is drawn on the same simple grid. The basic fonts are rectangular, with rounded angles; some are roughened or blurred. The structure of the family is an open system, allowing for foreign influences. When Van Wageningen wanted to add two 'female' Gagarins with a more calligraphic streak, he invited a young Flemish designer named Nele Reyniers to participate in his project. Being left-handed, she incorporated the inversed stress of a left-handed broad-nibbed pen in her two contributions to the Gagarin family, Leonora and Magda. A serif version of Gagarin drawn by Reyniers is on its way.